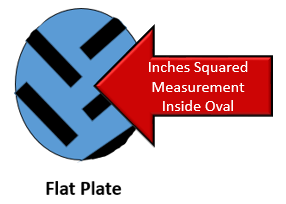 What is a flat plate measurement and how does it affect flotation, traction, and yield? As discussed in “Better Yield” post, larger flat plate is important as increased flotation and larger contact patch enables more full weight disbursement, thus reducing compaction. Click Better Yield Basics Post link if you need review. Best use of Flat Plate Measurement is by comparing sizes among manufacturers. Reason: there is no standardized methodology or air pressure to measure flat plate. As a result, measurement varies between manufacturers; however, they are consistent within each individual manufacturer. In short, VF rated 173 D tire has 16% larger flat plate. It is also important to note that higher load speed index will also contribute to less air pressure required to carry load. Choose highest Load Speed Index available. Agtiretalk.com is a tremendous resource. Thank you!